Aims: To study the etiopathophysiology of ectropion and entropion in a sub-Saharan tertiary eye care center and examine how it differs from reports elsewhere. Methods and Materials: This was a retrospective audit of all consecutive patients who presented with ectropion or entropion to the oculoplastics clinic of a tertiary eye care unit. We reviewed the medical records of all such patients and data extracted include age, gender, etiopathology, and diagnosis. The primary oculoplastic disease was used in classifying the patients. The study period covered January 2008-June 2012. Results: A total of 53 patients were identified constituting 37.3% of all eyelid diseases. Thirty-three (62.3%) were males. 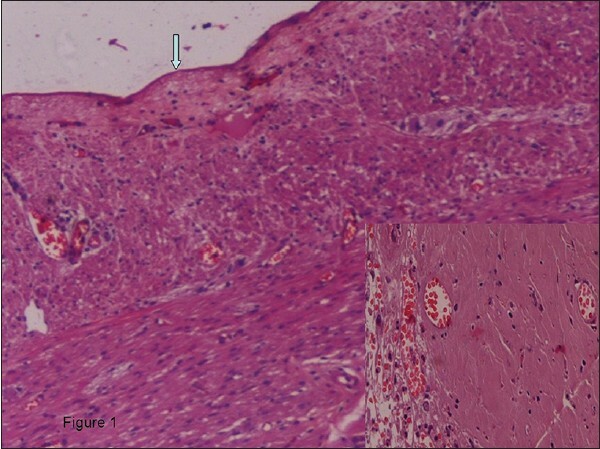 Forty-eight (90.6%) had ectropion, 43(89.6%) of which were cicatricial ectropion. Five (9.4%) had entropion. The median age group affected was 30-39 years (26.4%). 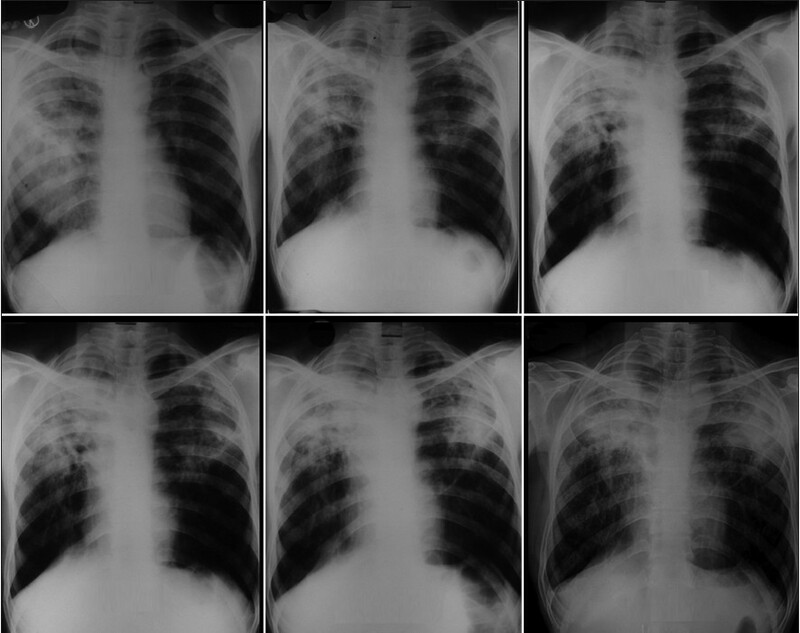 There were no cases of congenital ectropion or entropion. 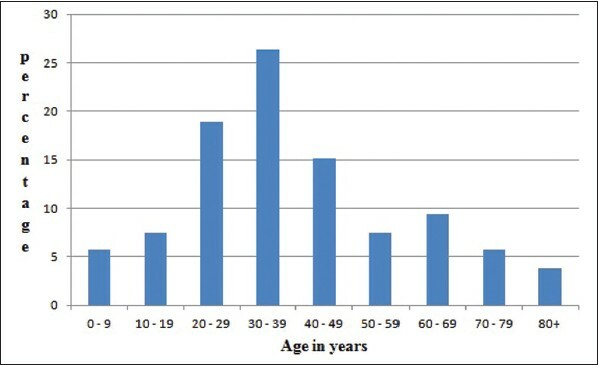 The leading etiological factor was trauma in 36 cases (67.9%), which was mostly due to road traffic accidents (50.9%). Conclusions: This study highlights a difference in etiopathophysiology of ectropion and entropion in a sub-Saharan region when compared to reported data from developed countries. In Nigeria, ectropion (which is often cicatricial) is usually secondary to trauma whereas senile involution is the common cause in many developed countries. This finding has implications in appropriate planning and skill acquisition for surgical correction in this group of patients. Background: There is paucity of data in Africa on the prevalence of pulmonary hypertension (PHT) and its impact on morbidity and short-term mortality in heart failure (HF) patients. The aim of this study was to assess the prevalence of PHT, its clinical characteristics and in-hospital mortality among HF patients admitted to a referral hospital in Nigeria. Methods: The study was carried out on serially-admitted HF patients who satisfied the inclusion criteria, in a Nigerian tertiary health center. 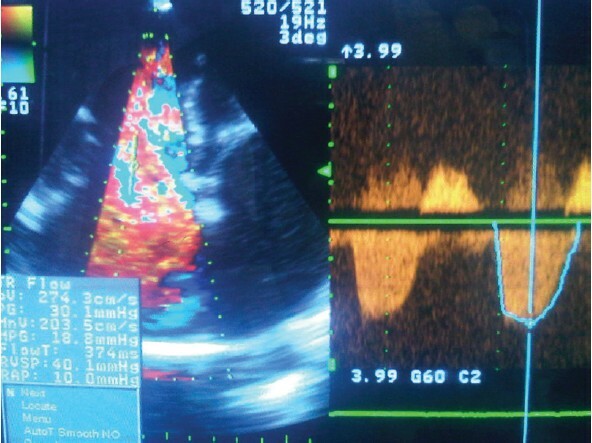 PHT was defined as the presence of mean pulmonary artery pressure (mPAP) of ≥25 mmHg, assessed using Doppler echocardiography and Chemla formula. Results: A total of 80 admitted HF patients were studied serially. 53 of them (66.25%) had PHT while the remaining 27 (33.75%) had normal mPAP. mPAP was 38.31 ± 12.23 mmHg and 16.39 ± 5.48 mmHg (P < 0.001) for subjects with and without PHT, respectively. The most common cause of HF was hypertensive heart disease (HHD) (28 patients; 35%). Subjects with PHT had relatively lower systolic blood pressure (SBP) (P = 0.044), and larger left atrium (P = 0.036) and left ventricle (LV) at both end-diastole and end-systole (P = 0.036 and P = 0.008, respectively), and a trend toward lower LV ejection fraction (LVEF) (P = 0.053). There was no relationship between mPAP and N-terminal pro-B type natriuretic peptide (P > 0.05). A total of 12 HF patients (15.0%) died, out of whom 8 (66.7%) had PHT. Cardiogenic shock (P = 0.044) and trans-mitral flow velocities ratio (P = 0.023) were the independent determinants of in-hospital mortality. Conclusion: PHT was common among the admitted HF patients, and was associated with worse morbidity indices, and a trend toward higher mortality. We recommend that HF patients be screened for PHT, and its presence should be taken into consideration in the management and prognostication of affected patients. Background: Communication skills are vital in clinical settings because the manner in which bad news is delivered could be a huge determinant of responses to such news; as well as compliance with beneficial treatment option. Information on training, institutional guidelines and protocols for breaking bad news (BBN) is scarce in Nigeria. We assessed the training, experience and perceived competence of BBN among medical personnel in southwestern Nigeria. Materials and Methods: The study was a cross-sectional descriptive study conducted out among doctors and nurses in two healthcare institutions in southwestern Nigeria using an anonymous questionnaire (adapted from the survey by Horwitz et al. ), which focused on the respondents training, awareness of protocols in BBN; and perceived competence (using a Five-Point Likert Scale) in five clinical scenarios. We equally asked the respondents about an instance of BBN they have recently witnessed. Results: A total of 113 of 130 selected (response rate 86.9%) respondents were studied. Eight (7.1%) of the respondents knew of the guidelines on BBN in the hospital in which they work. Twenty-three (20.3%) respondents claimed knowledge of a protocol. The median perceived competence rating was 4 out of 5 in all the clinical scenarios. 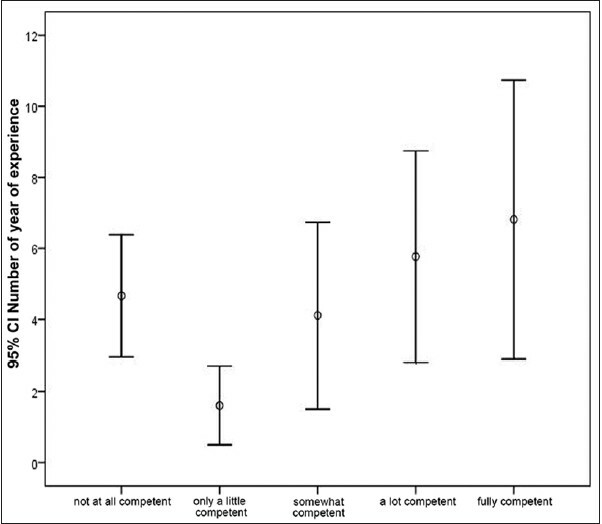 Twenty-five (22.1%) respondents have had a formal training in BBN and they generally had significant higher perceived competence rating (P = 0.003-0.021). There is poor support from fellow workers during instances of BBN. Conclusion: It appears that the large proportion of the respondents in this study were unconsciously incompetent in BBN in view of the low level of training and little or no knowledge of well known protocols for BBN even though self-rated competence is high. Continuous medical education in communication skills among health personnel in Nigeria is advocated. Background: Exstrophy anomalies, although rare, pose a tremendous challenge to both surgeons and surrogates. Management is intricate and experience with large members is restricted to a few centres worldwide. This report is a review of 18 cases of these anomalies managed in University of Maiduguri Teaching Hospital (UMTH) over 8 years, highlighting the intricacies of management, and contributes to the existing data bank on this subject matter in our environment. Materials and Methods: We reviewed the records of all cases of anomalies that were managed in the index hospital from December 2002 to December 2010. Results: Eighteen cases were studied. The youngest was a 2-day-old neonate and the oldest was 6 years at repair, with a median age of 4 months. There were 7 boys and 9 girls with bladder exstrophy, and the remaining two were girls with cloacal exstrophy, giving a male-female ratio of 7:11 for the exstrophy anomalies. Eight patients (33.5%) had associated congenital anomalies; 16.7% had undescended testes (UDT), anorectal malformation (ARM) and patent processus vaginalis (PPV); and duplicate bladder occurred in 5.6% of the patients. All but one patient had bilateral posterior iliac osteotomy at bladder closure. Out of the 17 patients that had osteotomy, 76.5% had satisfactory bladder closure (no complication), 5.9% had superficial wound dehiscence, 11.8% had bladder neck dehiscence and 5.9% had complete disruption. The lone patient that did not undergo osteotomy had complete bladder dehiscence. Postoperative immobilization was done for 3 weeks for 16 cases; one was discontinued after 1 week because of complication. The longest follow-up was for 2 years and the shortest for 2 weeks. Four patients (22.2%) did not turn up for follow-up. Conclusion: Exstrophy anomalies although rare remain a major challenge in paediatric surgery. Iliac osteotomy, among other technical considerations, remains a cornerstone for successful bladder closure. Background: Information about diabetes mellitus (DM) from the rural populations in Nigeria, particularly among the rural Fulanis is limited. Materials and Methods: This was a cross-sectional study conducted in two rural districts of Sokoto State in Northern Nigeria. Using a modification of the WHO STEP wise approach to surveillance (STEPS) instrument, information on sociodemographic and anthropometric data was obtained. Either a casual or fasting plasma glucose (FPG) level was obtained in all subjects while oral glucose tolerance test was performed in a randomly selected group of 50 of the study participants. Results: Three hundred and ninety-three subjects participated in the study. The prevalence rates of DM, impaired fasting glycemia (IFG), and impaired glucose tolerance (IGT) were 0.8, 6.9, and 8%, respectively. The mean (SD) FPG was higher in males (5.1 ± 0.6 mmol/L) than in females (4.9 ± 0.6 mmol/l), but not statistically significantly (P = 0.20). The major risk factors for DM among the rural Fulani were obesity and increasing age. Conclusion: The prevalence rates of DM and its principal risk factor obesity are low among the rural Nigerian Fulani. However, the prevalence of prediabetes is relatively high, a factor that may predispose to the future development of DM. Aims: The aims of this study were to identify and understand the factors underlying prescribing errors in order to determine how to prevent them. 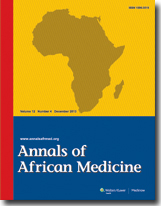 Materials and Methods: A prospective qualitative study that involved face-to-face interviews and human factor analysis in a Tertiary Referral Hospital in Central Nigeria, from July 2011 to December 2011. Pharmacists in the study hospital prospectively reviewed prescription orders generated by doctors in selected wards (male and female medical, pediatric and the private wing wards) and identified prescribing errors. The 22 prescribers involved in the errors were interviewed, and given questionnaires to discover factors causing the errors. A model of human error theory was used to analyze the responses. Results: Responses from the doctors suggest that most errors were made because of slips in attention. Lack of drug knowledge was not the single causative factor in any incident. Risk factors identified included individual, team, environment, and task factors. Junior doctors were affected by the prescribing habits of their seniors. Organizational factors identified included inadequate training/experience, absence of reference materials and absence of self-awareness of errors. Defenses against error such as other clinicians and guidelines were absent or deficient, and supervision was inadequate. Conclusions: To reduce the risk of prescribing errors, a number of strategies addressing individual, task, team, and environmental factors such as training of junior doctors, enforcing good practice in prescription writing, supervision, and reviewing the workload of junior doctors must be established.Aims: The aims of this study were to identify and understand the factors underlying prescribing errors in order to determine how to prevent them. Materials and Methods: A prospective qualitative study that involved face-to-face interviews and human factor analysis in a Tertiary Referral Hospital in Central Nigeria, from July 2011 to December 2011. Pharmacists in the study hospital prospectively reviewed prescription orders generated by doctors in selected wards (male and female medical, pediatric and the private wing wards) and identified prescribing errors. The 22 prescribers involved in the errors were interviewed, and given questionnaires to discover factors causing the errors. A model of human error theory was used to analyze the responses. Results: Responses from the doctors suggest that most errors were made because of slips in attention. Lack of drug knowledge was not the single causative factor in any incident. Risk factors identified included individual, team, environment, and task factors. Junior doctors were affected by the prescribing habits of their seniors. Organizational factors identified included inadequate training/experience, absence of reference materials and absence of self-awareness of errors. Defenses against error such as other clinicians and guidelines were absent or deficient, and supervision was inadequate. Conclusions: To reduce the risk of prescribing errors, a number of strategies addressing individual, task, team, and environmental factors such as training of junior doctors, enforcing good practice in prescription writing, supervision, and reviewing the workload of junior doctors must be established. Background: The prevalence of human immunodeficiency virus (HIV) infection is rising in Sub- Saharan Africa. The various indirect tests readily available have not been helpful in neonatal and early infant diagnosis of the disease. Polymerase chain reaction (PCR) is a direct test that can be used in these groups of children. Early infant diagnosis is important in achieving good outcome in the management of HIV infection. The aim of this article was to examine the role of PCR in the evaluation HIV-infected infants, with a view to achieve early diagnosis, early treatment, and good outcome. Materials and Methods: This was a prospective review of 174 infants delivered by HIV-infected mothers in a rural hospital from January 2007 to September 2008. The blood samples of the patients were collected and subjected to PCR analysis for detection of viral antigen. Two samples were collected, the first at 6 weeks and the second 6 weeks after that. The results were recorded, collated, and analyzed using SPSS version 17. Results: There were 174 infants, 100 boys, and 74 girls. The age range was 6-8 weeks (median 6 weeks). PCR was positive for both the samples in 12 (6.9%) infants. PCR was negative in both samples in 162 (93.1%) infants. All infants who were negative in the first sampling were found to be negative in the second sampling as well. None of the infant was positive for only one sample. Analysis of 12 positive infants revealed that 5 (2.9%) infants were placed on anti-retroviral drugs, 3 (1.7%) infants were not placed on anti-retroviral drugs because of low CD+ count, and 1 (1.0%) infant was lost to follow-up, while 3 (1.7%) infants died from sepsis. Conclusion: PCR has a role as a direct test in early diagnosis of HIV infection in infancy, particularly where the other direct test are not readily available. Background: Epilepsy is an important cause of childhood morbidity and its care is fraught with challenges. Itinerant search for remedy and manifestation as or with psychiatric disorders could result in presentation in a psychiatric unit. Identification of these challenges is essential to providing optimal care. The objective was to identify caregiver challenges in the provision of care to children with epilepsy presenting in a psychiatric unit. Materials and Method: Administration of a structured questionnaire to caregivers of children with epilepsy presenting, between September and December 2011, in the newly constituted Child and Adolescent Mental Health(CAMH) Unit of the Federal NeuroPsychiatric Hospital, Kaduna Nigeria. Results: A total of 84 caregivers were interviewed. The age range of the caregivers was 23 to 62 years (mean 38 ± 9.2 years) and a female preponderance (50, 59.5%). Most of the caregivers were in the upper social classes (I-III, 79.8%). A high number of challenges were indicated by majority 65, 77.4%) of the caregivers. The recurrence of seizures (84,100%) was the commonest challenge while the experience of discrimination (17, 20.2%) was the least. All caregivers had sought remedy from multiple health care options. Challenges were significantly (P < 0.05) associated with the female caregiver, age < 40 years, generalized type of epilepsy and residing outside Kaduna. Conclusion: The study identified multi dimensional caregiver challenges and highlighted the need for provision of comprehensive health and social services to children with epilepsy and their families. Background: Supportive supervision is a form of supervision that promotes quality at all levels of health system by strengthening relationships within the system through prompt identification and resolution of problems among others. It is an effective intervention in improving health worker performance in low resource settings. Malaria is responsible for majority of outpatient consultations in Nigeria at all levels of care. 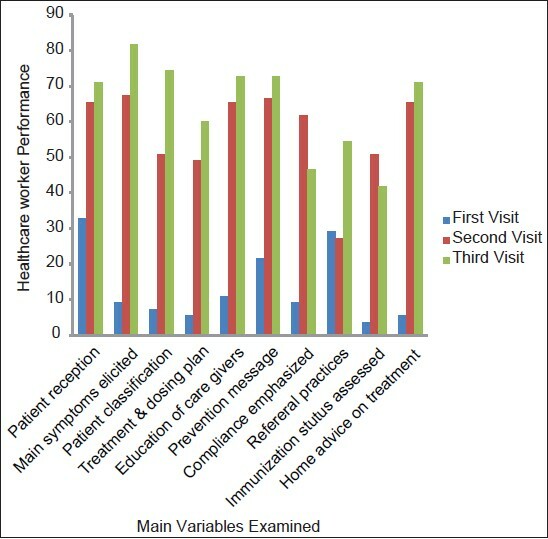 Materials and Methods: This was a facility-based interventional study with pre and post-intervention phases conducted among two groups.The study subjects were selected through a multistage sampling technique and data collection was done using both semistructured interviewer administered questionnaire and supervisory checklist. Results: The mean knowledge scores of malaria within the intervention group showed an increase from 10.3 ± 1.4 at preintervention to 11.3 ± 1.5 at post-intervention (P < 0.0015). The proportion of respondents who correctly followed malaria management guidelines increased from 32.73% at first supervisory visit to 70.91% by the third supervisory visit (P < 0.001). An analysis of the supervisory checklist showed improvement in performance of healthcare workers with each supportive supervisory visit in most of the variables examined. Conclusions: This study has demonstrated that supportive supervision is a feasible and practicable tool in improving knowledge and practice of malaria case management among PHC workers. Normal development of the female reproductive tract involves a series of complex processes characterized by the differentiation, migration, fusion, and subsequent canalization of the Müllerian system. Uterine anomalies result when these processes are interrupted. Bicornuate uterus is a unification defect of the Müllerian ducts, and it is estimated to represent 10-39% of Müllerian duct anomalies. Pregnancies in bicornuate uterus are usually considered high-risk because of association with poor reproductive outcomes, such as pregnancy loss, preterm birth, malpresentations, and fetal deformity. Routine cervical cerclage and Strassman metroplasty have been advocated as treatment for this anomaly. 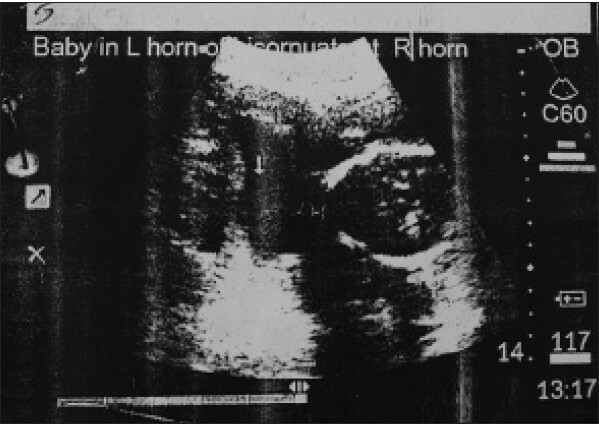 We report a case of successful pregnancy in one of the horns of a bicornuate uterus managed in our unit.